Overnight continuous feedings are typically used for children who need additional calories beyond what they can take orally or by feeding tube during the daytime hours. In addition, children who are fed around the clock, especially children with GJ-tubes or J-tubes, are typically fed continuously during the night, as well as during some or all of the daytime. For more information on continuous feeding during the daytime, see our page on Continuous Daytime Feeding. Parents are universally concerned about tangling of tubing around a child’s neck during overnight feeds. While this is a widespread concern, we haven’t heard of infants and children becoming hurt as a result of tangling. Tangled lines are far more likely to result in line occlusions and feeding pump alarms. Tip: To prevent “feeding the bed,” use an AMT clamp to keep the tubing and extension set together at night. There are steps you can take to reduce the amount of tangling. The key is to keep the tubing away from the child’s head. For an NG-tube, you should tape the tubing down the child’s back, then down the pajama leg. If the pajamas are two piece, you can run the tubing inside the pants leg. For G- or GJ-tubes, you can tape the extension to your child’s stomach using a gentle tape like micropore or hypafix. Or you can use a tape tab and secure the extension set to clothing. Then run the tubing down the inside of a pajama pants leg. Some parents have used baby legs, which are like leg warmers. Others have found that sleep sacks with a hole at the end are also effective. 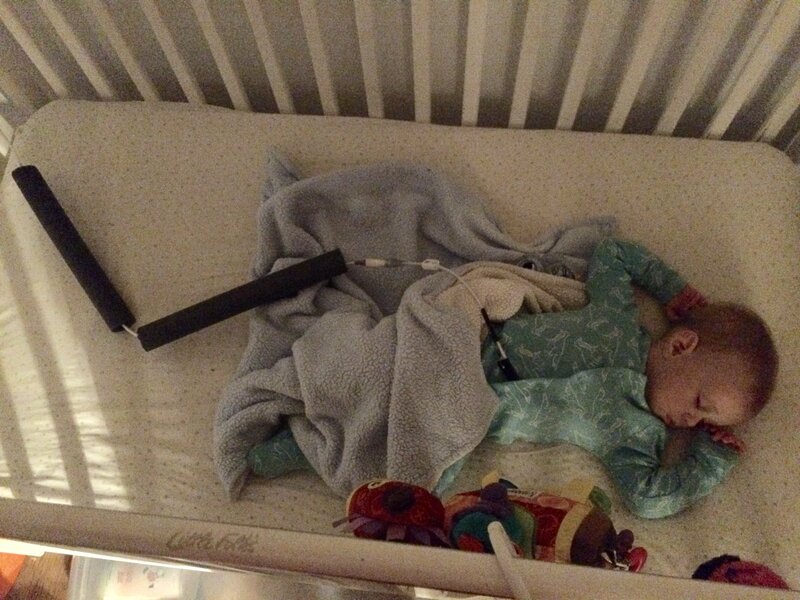 If you use an IV pole, place the pole a few inches from the foot of the crib or bed. If your child gets tangled or pulls, you will hear the pole crash against the bed. You can use a section of a pool noodle, pipe insulation, or even an empty paper towel roll to tame tubes and prevent tangling, especially if you have multiple tubes or wires. There are also line tamers to corral multiple lines. Never run the tubing through the spindles of the crib. Run the tubing over the railing, so that when you go to pick up your child, you do not pull on the tubing if you have to pick them up quickly. Be careful taking your child in and out of the crib. The extension set can get caught between you and the crib/bed when you are leaning over and you can pull the button out. Often it is easier to “plug” them in after they are in bed, and to “unplug” before getting them out. Children who can climb out of their cribs at night should be corralled using a crib tent over the top of the crib. Older children may be able to be taught how to unhook themselves to go to the bathroom or how to carry their backpack when they get up. Tip: You don’t have to refill the bag in the middle of the night. Standard formula can hang for 8 hours without spoiling. If you live in a warm climate or are concerned about spoilage, place an ice pack in the feeding backpack, or rubber band it directly to the feeding bag. Children who are fed around the clock or just at night might need special adaptations to help them sleep safely. The following Frequently Asked Questions address the common issues that arise in Continuous Overnight Feeding. WHAT DO I DO WITH THE PUMP AND FOOD BAG AT NIGHT? If you have a backpack, you can hang it using a link or carabineer clip off the side of the crib or bed. Your home health care supplier may provide an IV pole for you to attach the pump and hang the bag. In either case, be sure to drape the tube over the top of the crib rail, and not through the side of the crib to avoid pulling the tube out. You don’t need to refill formula in the middle of the night! Most formulas, as well as breast milk, can be hung for 4-6 hours without refrigeration (check the label). But with an ice pack tucked in the backpack or rubber-banded to the feeding bag, you can likely go at least 8-10 hours. The formula will be about room temperature by the time it makes it to your child’s tummy. What pajamas work the best? Two piece or snap-up jammies are the easiest. For infants, sleep gowns also work very well because the tube can go right out the bottom, and they allow easy middle-of-the-night diaper changes. Zippered sleepers will work, but you will have to cut a hole for the tube to go through. Sleep sacks work well since most zip top to bottom, and the tube can just run out the bottom. If your child rolls around in bed, you will probably want to secure the extension down a pants leg. There are also products to adapt clothing, or special clothing made to be tube-friendly. Click here to see adaptive clothing in Useful Products. How do I keep bedding dry overnight? You will likely experience periodic vomiting, accidental “feeding the bed,” or diaper leaks. Keep extra bedding nearby for a quick overnight change, or you can layer bedding and just peel off soaked layers as needed. Reusable chux pads work great under sheets to help protect the mattress and another layer of clean bedding. Some also choose waterproof mattress covers for added security. Overnight diapers are a must for children who are not toilet-trained, especially if your child sleeps (mostly) through the night. They start at size three. There are also diaper boosters, cloth options and hybrid options. You may choose to use an overnight disposable diaper and a cloth outer layer. For more suggestions, see The Pee Soaked Bed: Options for Super Soakers from Complex Child. How do I elevate my child’s crib or bed? It is often recommended that children who are fed overnight, especially if they have reflux, be elevated to a 30 degree angle. You can elevate a crib or bed by putting large soup cans or books under the feet on one end. You can also elevate the mattress by placing items under the mattress. Examples include pillows, blankets/comforters, and towels. Do not put these directly under a baby or a child for safety reasons, but rather under the mattress. Use rolled towels to make a “U” shape to keep your child from sliding down. If you are crafty, sew fabric into tubes and fill with uncooked rice to mimic the positioning tubes used in NICUs. There are lots of products out there to help keep your child in an elevated bed, or to help with positioning. Check with your child’s doctor before you use any products in the crib or bed to make sure they are safe for your child. Click here to view Inclines and Beds in Useful Products. What about my older child who is unable to sleep in a traditional bed safely? There are a few specialty beds you can purchase, and you will likely need letters of medical necessity in order to get these beds covered by insurance. Click here to view Inclines and Beds in our Useful Products section. Some insurance companies will push for a traditional hospital bed, which may not be appropriate for your child. The manufacturer of the bed you select should be willing to work with you to get insurance approval. See Funding for Specialty Medical Beds from Complex Child for more information on getting a bed approved for your child. Some crafty parents have rigged traditional beds, including bottom bunks. There are a wide variety of add-on bed rails available for purchase. A bottom bunk of a bed can be almost fully enclosed if placed against a wall with a bed rail on the open side. Similarly, a day bed can be made into an enclosed space by adding a rail or gate to the open side. There are also wedges, bed tents, and special reflux beds available for purchase. Click here to view Inclines and Beds in Useful Products. How do I transition my child on continuous overnight feeds from a crib to a toddler or regular bed? Parents are always concerned about children moving out of their cribs. It is OK to keep your child in his crib longer than is typical, as long as he is safe to sleep in it. If your child understands that she is connected to the feeding pump and isn’t trying to climb out of the crib, the transition to a toddler or regular bed should go pretty smoothly. Young children can be very proud to move to a “big kid” bed and can be taught to wait for someone to help them disconnect from the pump before getting out of bed. If your child is climbing out of the crib, she may still not get up and pull the feeding pump along when she is in a toddler or regular bed. If your child does like to get up on her own, there are bed tents. However, more often than not, we hear from parents that they were concerned about the transition, but it didn’t end up being a problem once they moved their child. We purchased 1/2 inch pre-slit pipe insulation in the plumbing department at Lowe’s, 6-foot long for less than $1. The pipe insulation is much more flexible than a pool noodle. Our son has a Farrell Valve too, so he has longer lines and 2 lines coming together at one point (his favorite place to pull apart and wrap around himself). At first, we cut one long piece of pipe insulation to fit the length of the feeding tube lines that were in his crib. It was very easy to slip around the line because it was already preslit. It was flexible, but not flexible enough for our son as he moved around his crib. Later, we took it off and cut it into 3 smaller pieces that now allow him to move with freedom wherever he wants to go. We haven’t covered the pipe insulation yet, but we are going to make a fabric cover so he does not chew on it.